Half of our children are starving, and yet we say India is Shining! A long time ago, as part of my job in the 1980s, I used to visit village Anganwadi centres under the Integrated Childhood Development Service (ICDS) scheme. The situation was quite bad even in the relatively prosperous state of Haryana. But as Sunanda, the Angawadi worker reports (below) in the Economist, she has weighed children for 25 years and "nothing has changed". They remain malnourished. In BFN I showed how socialism and lack of freedom harms the IQ of children. This is one of the most potent pathways – through malnutrition. We are ruining the future of our country by starving our children. In BFN I also showed how poverty can be ELIMINATED in just three years. But the socialists of India are more intent on spouting HOT AIR about how much they care for the poor than in actually getting the poor out of the poverty zone. True, this issue is bigger than just poverty elimination (involving education as well), but that is why we need a revolution in the way India is governed. VISHAL, the son of a farm labourer in the west Indian state of Maharashtra, is almost four. He should weigh around 16kg (35lb). But scooping him up from the floor costs his nursery teacher, a frail woman in a faded sari, little effort. She slips Vishal’s scrawny legs through two holes cut in the corners of a cloth sack, which she hooks to a weighing scale. The needle stops at just over 10kg—what a healthily plump one-year-old should weigh. The teacher nods and puts Vishal back on the floor, where he sits listlessly before a jigsaw puzzle. That his teacher does not look perturbed is unsurprising. Nearly half of India’s small children are malnourished: one of the highest rates of underweight children in the world, higher than most countries in sub-Saharan Africa. 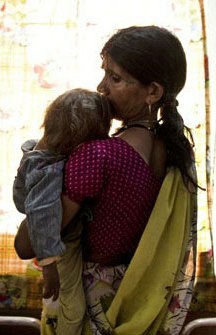 More than one-third of the world’s 150m malnourished under-fives live in India. Since 1991 GDP has more than doubled, while malnutrition has decreased by only a few percentage points. Meanwhile, the chasm between lucky and unlucky Indian children is growing: under fives in rural areas are more likely to be underweight than urban children, low-caste children than higher-caste children, girls rather than boys. Even the children of wealthier families suffer surprisingly high rates of malnutrition. Government data show that a third of children from the wealthiest fifth of India’s population are malnourished. This is because poor feeding practices—foremost among them a failure exclusively to breastfeed in the first six months—play as big a role in India’s malnutrition rates as food shortages. Most growth retardation occurs by the age of two and is irreversible. Often, it starts during pregnancy. More than half the women of childbearing age in India are anaemic—a condition that can be much improved by fortifying food—and 30% of Indian children are born underweight. In healthy infants, this could be corrected with six months of exclusive breastfeeding. But especially in rural India, where women often go back to the fields mere days after giving birth, babies’ diets are often supplemented with cow’s milk and water, which exposes them to infection. But countrywide the scheme suffers from the usual ailments of public services in India. Recently the production of daily meals served at anganwadi centres was taken out of the hands of pilfering contractors and given to groups of local women. This entry was posted in Uncategorized and tagged in Poverty in India.